Last night we had a great rainstorm here in San Antonio. Makes everything look so clean and bright. 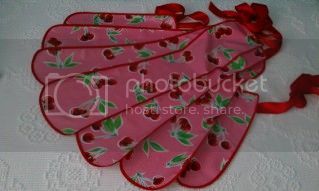 Thought this perky Cherry apron would add a little of the cheer to our followers out there. Dont forget to mark your calendars for The Girls at Rusted Gingham's Barn Sale on November 2 and 3, 2012. We will be there with all of our eclectic collection of goodies. I'm lovin the cherry apron! TEN WEEKS away from the Barn Sale! I know everyone is going to LOVE your booth!